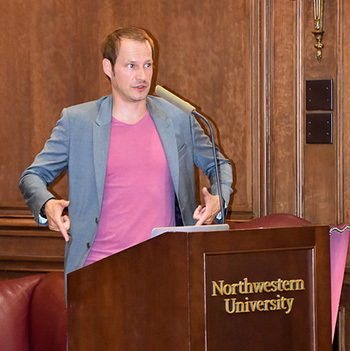 German author and ZDF TV host Tim Niedernolte during his talk at Northwestern on June 4. Daniel Schneider, Tim Niedernolte and Dr. Andreas Götze during the Q&A. Tim Niedernolte was a successful television host at one of Germany’s most watched channels when he suddenly felt that something was missing in his life. What would be his larger contribution to society? 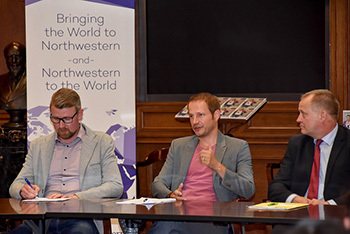 At a June 4 talk co-hosted by the Office of International Relations and the Department of German, and co-sponsored by the Medill School of Journalism, Media, and Integrated Marketing, Niedernolte explained how he found the answer and wrote a book to share his experience with others. He and his co-author, Daniel Schneider, spoke with Germany’s Deputy Consul General Andreas Götze on how this existential question led them to write “Wunderwaffe Wertschätzung,” about the power of appreciation in efforts both grand and small. In the book, Niedernolte and Schneider delve into their own experiences as journalists, authors and appreciators of everyday life, and shared the stories of German icons—chef Christian Rach, TV journalist Dunja Hayali, and more—to understand how appreciation can transform difficult situations. The concept of Wertschätzung, the German term for appreciation and valuing life, seems to ring true to readers. Since February, when “Wunderwaffe Wertschätzung” was first published, the co-authors have come out with a second edition, with a third on the way, and have spoken on the subject on TV and radio shows, at events and in bookstores across Germany, and now, in the United States. “The more time I spend on this subject, the more I believe that a lifestyle of appreciation can change lives and can change society,” Niedernolte told attendees, who were a mix of journalism and German studies students and professors, and members of the German American community in the Chicagoland area. As an example, Niedernolte told the story of Christian Rach, one of the most popular television chefs in Germany and Europe, whom he interviewed for his book. Early in Rach’s career, the Thai Industrial Association invited him to cook for a prestigious event for members of the royal family, business leaders and Thai military personnel. But the gig was offered on very short notice—Rach only had two days to create an elaborate feast. Instead of stressing out and ordering around kitchen staff, Rach took the time to get to know his team better. He sat and talked with them and tasted the foods they had brought from home. The next day, the staff “moved heaven and earth” for Rach, Niedernolte said. They prepared the food together efficiently and harmoniously, pulling off a successful dinner reception. In fact, the process of writing the book itself was deeply rooted in appreciation. In 2017, soon after Niedernolte began feeling a need for change, he and four friends, including Schneider, met for two days in Linz, Austria to discuss their passions, what they believed was missing in the world and what they could do to make the world a better place. Finally, they settled on the simple, life-changing concept of Wertschätzung. Niedernolte and Schneider believe that a little appreciation can go a long way, both on a grand scale in business, politics and society, and across borders, and on a small scale in daily interactions with family, friends and strangers. The co-authors, who also have had rich careers in journalism, relate appreciation to the practice of reporting. In an era of unprecedented “fake news” and anonymized hatred on social media, Niedernolte cites constructive journalism as an appreciation-based way of transforming the industry. The trick, Andreas Götze said in the conversation following the talk, is to see the humanity in others. Though his work as a diplomat prioritizes protocol to maintain foreign relationships, such decorum does not preclude the real human connection necessary for progress to be made. But it’s not just foreign relations that benefit from appreciation; as a television reporter and host, Niedernolte said he always goes around to shake his team members’ hands after a shoot, just to say thanks. “In the TV business, you have a very big team that is responsible for filming and making sure the shoot goes well, so I want to show my appreciation,” Niedernolte said. View photos from the talk and the journalists' visit to Northwestern here.